Where has it come from? "Closing Off" the Aura - have a read!! is offered, deposits and full payment due prior to commencement of the Relaxation Course. Learn how to perform a full body massage sequence using many techniques that are unique to Traditional Indian Ayurvedic Massage, and integrate (or revise) some you may already be acquainted with from more familiar Western sources. Ayurvedic Medicine is centuries old, and is "tried and true" in it's effectiveness. It is easy to learn and to apply, but can have far reaching benefits that go well beyond simply soothing and relaxing your client. Ayurvedic Relaxation massage is particularly beneficial for de-stressing and detoxing the body, leaving your receiver feeling totally relaxed and at the same time energised. On completion of this course students will receive a certificate of completion which (after completing the required number of contact hours, case histories and work logs), enables the student to sit a Practitioner's assessment, which upon successful completion qualifies the student as a Practitioner of Ayurvedic Relaxation Massage - an Industry Accredited qualification. Traditional Ayurvedic oils, as well as therapeutic quality Young Living Oils are used throughout the course. Chakra aligning and Healing techniques are also learned, along with an introduction to aromatherapy. Saturday morning - getting to know each other, theory, and making your own personal massage oil blend. After lunch it is all hands-on. massage shared to allow students to experience a full body relaxation massage. Please note the Ayurvedic Relaxation Massage course is a pre-requisite for the Marma course. price of $675 is offered, deposits and full payment due prior to commencement of the Relaxation Course. Marma massage can be integrated with the Relaxation sequence, or as a separate massage concentrating entirely on relaxation and Marma points. Many people refer to Marma Massage as the ultimate relaxation massage. 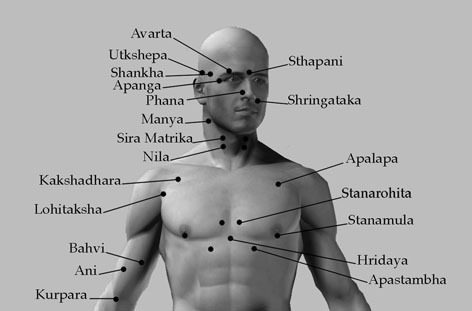 A Marma point is the traditional Indian equivalent of an acupressure or acupuncture point. They are specific energetic points distributed throughout the body that relate to functions of organs and the metabolism in general, that can be helped and stimulated by massage. Marma points are more accessible and easier to master because they are much larger in area than an acupuncture point, therefore require much less skill and training to accurately locate. By gently stimulating and massaging any one of the 107 known Marma points and by releasing energy blockages, one can specifically treat a problem area in the body in the same way that acupuncture and acupressure does. The knowledge of these vital points has been used for thousands of years by Ayurvedic physicians. It is known to be beneficial for a very wide variety of ailments and chronic conditions, however as we said at the outset, its primary application in this instance, is its use as one of the most relaxing forms of massage you may have yet encountered in your travels. On completion of this course students will receive a certificate of completion which (after completing the required number of contact hours, case histories and work logs), enables the student to sit a Practitioner's assessment, which upon successful completion qualifies the student as a Practitioner of Ayurvedic Marma Massage - an Industry Accredited qualification. I thoroughly enjoyed my training and have been applying my new skills on the family so far. most of all though you give wholeheartedly of yourself and that is the true gift! What a pleasure to experience training that is delivered professionally, concisely and with such great subject knowledge. Deirdre Campbell is a passionate trainer, who ensures the highest of standards in her training. Deirdre is very supportive of her students not only during the course but also throughout the learning journey. The training was extremely enjoyable, informative and conducted in a positive learning environment. I have no hesitation in recommending Deirdre and her programs. particular course but the proposed date as listed does not suit, as all dates are flexible. Other days (including weekdays) are available subject to demand – please advise if you are interested in a week day course. The only way we can accommodate as many busy people as we do, is by being flexible, so don't be afraid to ask for alternate dates. Something very special is in the process of happening. If you have bothered to read this far, you are probably going to be part of it! !